Alright, so a few days ago, I posted a tutorial on making Drunkard's Path blocks using a four patch for the quarter circle. A technique I used to make a gift for a friend. I got a bit wrapped up in the tutorial and didn't show you the quilt! So! Here it is! The blocks are 4" (so a full circle is 8") cut on my big shot with the Drunkard's Path dies. I gave it a border of neutral, pastel and low volume 2.5" squares. 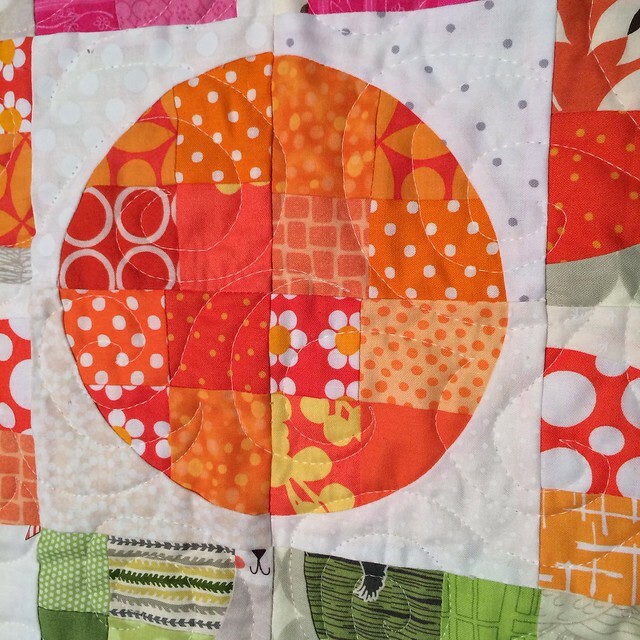 It was the hunt for orange fabrics that made me realize I needed to sort my scrap bin! These airplanes are my favorite! The binding is made from scraps of the Frippery Peacocks from Thomas Knauer. 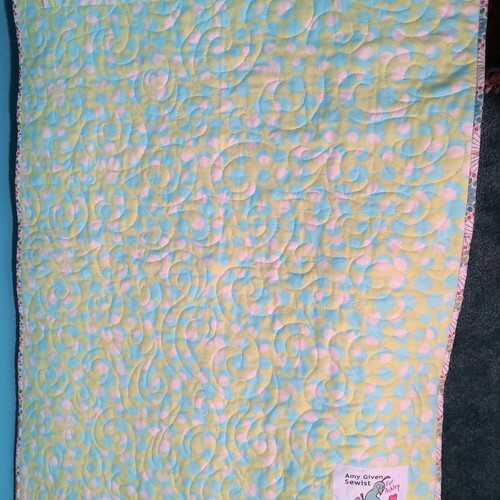 The pic is a little washed out, but you can see the quilting! And it's the first time I've used my new quilt labels! 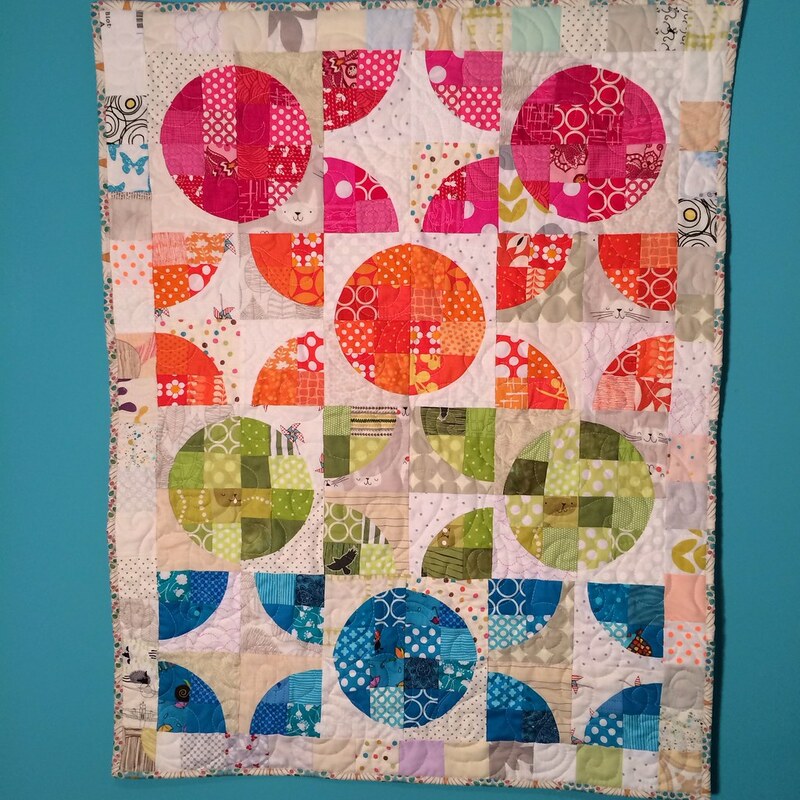 It was a fun quilt to put together, and I've got a few extra blocks (and the black ones from the tutorial) that I've been messing with. 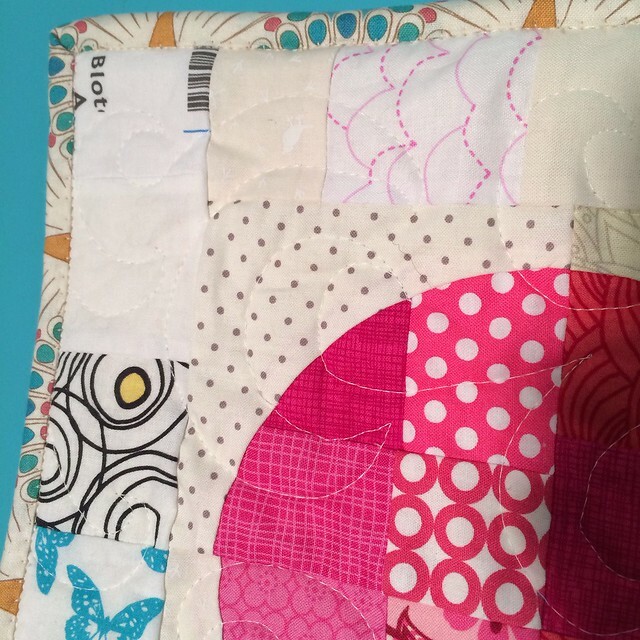 Maybe a new quilt is in the works? We'll see, though I already have a queue! Super cute. 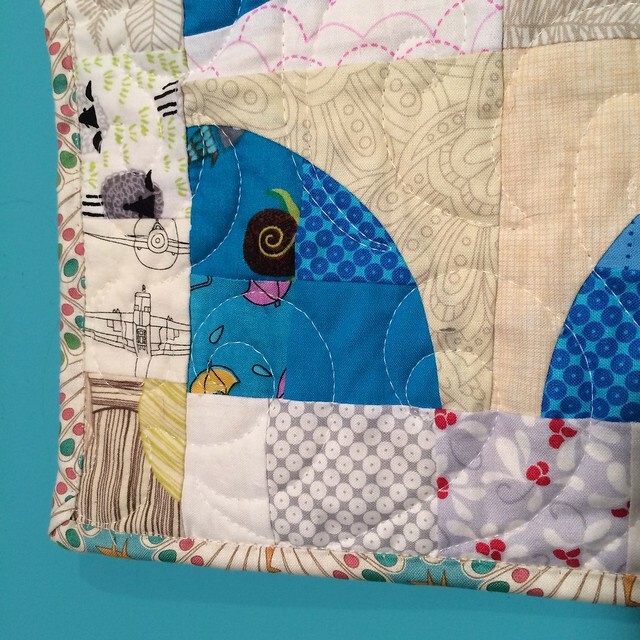 I really love this quilt, especially the great mix of background prints. Also, where did you get your labels? 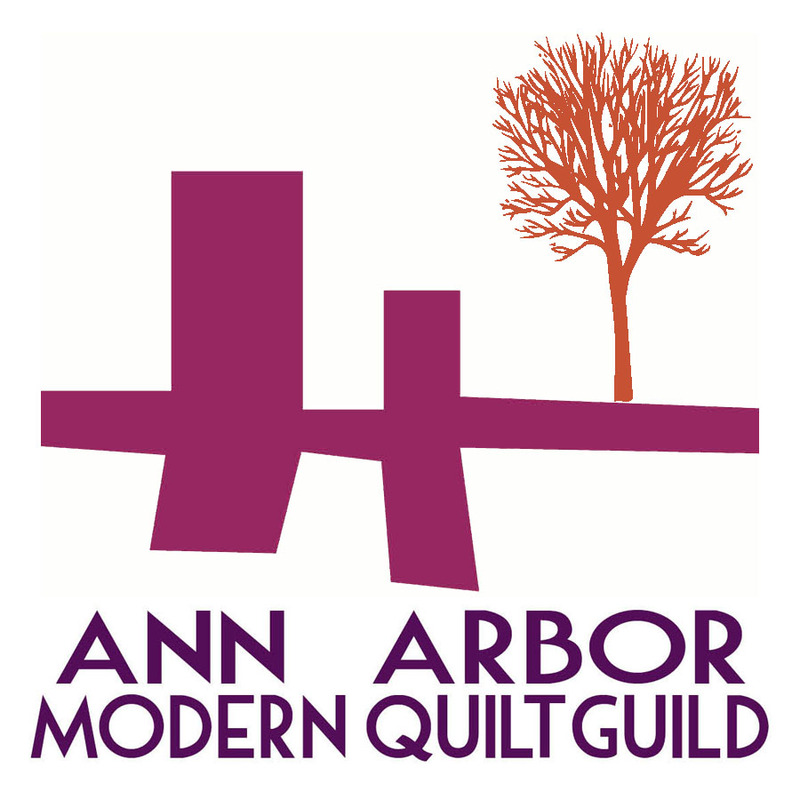 I have been wanting to get some made so I can start to label my quilts. Spoonflower! You just have to leave space between the designs. Of course, I should have left more than I did. And I used iron on double sided adhesive to attach it. 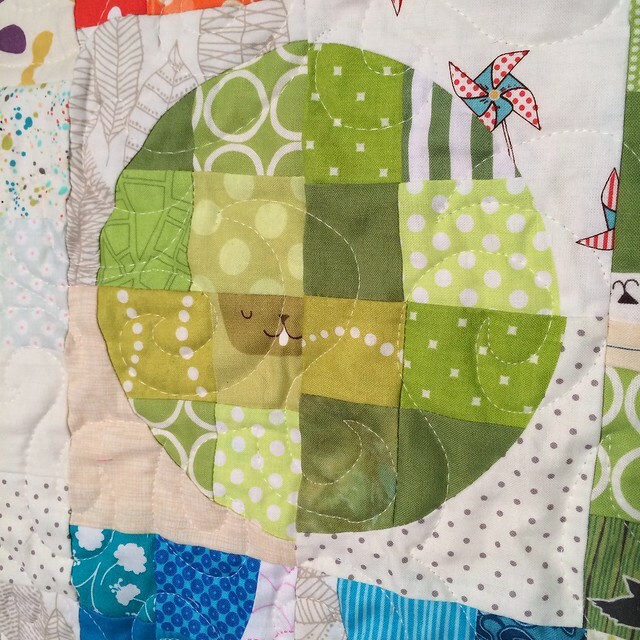 So is it just the quilting weight cotton from spoonflower? And how much space do you recommend leaving? Yes, I used the Kona cotton. I left /12 an inch, which is just barely enough space - fine if you're adhering them, but not quite enough for piecing, without cutting into the words on one side or the other. So, I would suggest at least 3/4 of an inch between.